For many of us, the Cliven Bundy story started when a fringey rancher got a bunch of his militia pals to flex their white privilege by threatening to shoot federal law enforcement officers who'd demanded that Bundy stop stealing public land and grazing; then Bundy's loathsome offspring led a terrorist takeover of a wildlife refuge in Oregon. 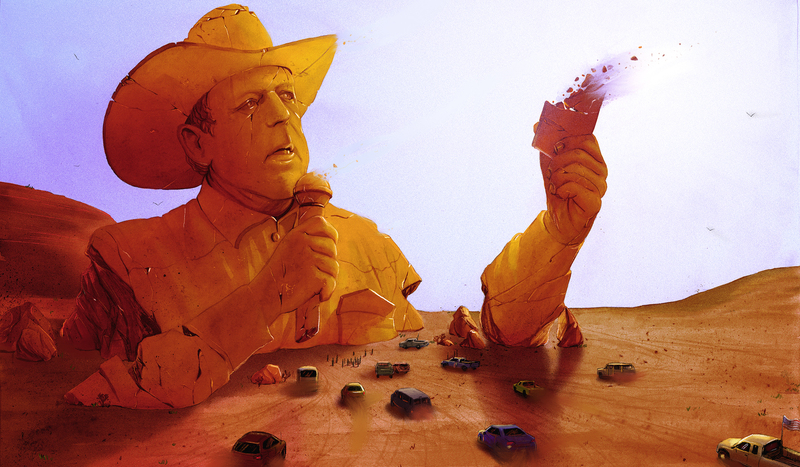 But in Bundyville, a new podcast series from Longreads and Oregon Public Radio, investigative journalist Leah Sottile leads us through the bizarre history and beliefs of the Bundy cult, in a tale than blends lethally reckless US government nuclear tests, apocalyptic Mormon prophesies, the most vicious white supremacist beliefs, loony interpretations of the US Constitution and a cult of personality that has surprising intersections with mainstream Mormon leaders and politicians. It's a fascinating listen, and I got through all seven segments in one day. I really recommend it as a potted history and extremely informative profile of a current in American far-right mysticism that has repeatedly breached into the public consciousness through spectacular acts of violence, which have been largely met with total impunity -- and now that a Bundy is running for governor of Nevada, this could not be more salient.